Kids definitely have a whirlwind romance with sugar and candies. By making a commitment to children’s oral health and hygiene we are saving them from future problems and complications. If you find that your kids are over indulging in sweets there are some tactics you can use to reduce the risk of tooth and gum complications. Here are some tips on how to protect your children’s teeth so they can have good strong teeth and optimal oral health when becoming adults. When we think of a season that holds the most fun for kids, we think of summer. We think of longer warm days full of activity and fun. Kids are thrilled when they get out of school and their daily diets can become a bit unstructured. If you spend the summer months with your kids going to basketball and baseball games, or possibly a swim meet, you know that there are concession stands and vending machines at every turn. It is easy for kids to grab something fast such as a pack of Gummi Bears or an ice cream. If you know you are planning to go to these places full of junk food and candy, why not plan ahead. Bring healthy snacks such as trail mix and cut up fruit. Pears, apples and celery are an excellent choice for rinsing away all that bacteria that lingers in the mouth. These healthy food items will decrease the risk of developing cavities and will protect your children’s teeth in the long run. If you want to protect your children’s teeth; watch what they eat. When eating sugary snacks with your kids, make sure they have water and a small protein based meal as well. Make sure they chew their food numerous times before swallowing as this will rid their mouths of bad bacteria that can grow over time. If you want to protect your children’s teeth, make sure you read the labels on the back of their favorite cereals and snacks. Avoid items with too much sugar like sports drinks, juices and soda pops. 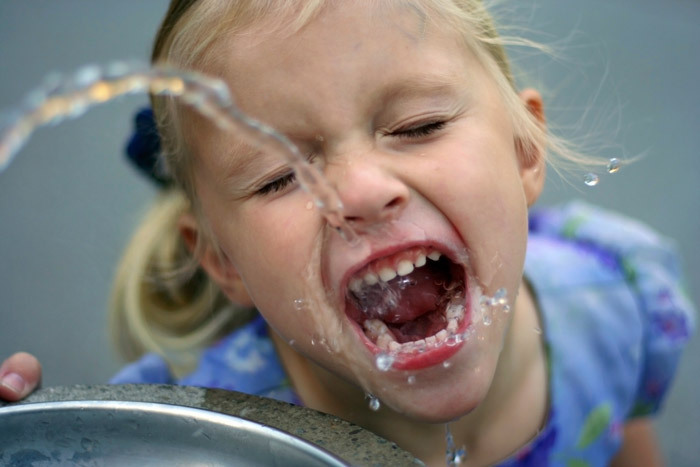 Water is always the number one choice when it comes to optimal oral health as it rinses away the acid that forms when sugar and bacteria come together. When out on the run, keep water bottles and sugarless gum on hand for those candy craving attacks. Sticky candies like chocolate bars and jelly beans attack the mouth with acid and can cause sugar to stick around in your child’s mouth more than it should. If out at a ball game or other snack haven, stick to items with less or not sugar such as oversized pretzels, roasted chestnuts and popcorn. This can improve oral health in more ways than one. At Metroplex Dental we can educate you on how to protect your children’s teeth so they can remain free of cavities, tooth decay and other complications. It’s never too late to learn and your kids will be healthier for it. Give us a call today! This entry was posted on August 11, 2011. It was filed under blog .